One of the greatest sets of geological events to ever have occurred in North America was the Missoula Floods. Occurring as many as 40 times during the last ice age, the floods were caused by waters released from ancient Lake Missoula that scoured the Columbia River basin, carved out the Columbia River Gorge, and swept across at least 16,000 square miles of the Pacific Northwest. This Science Pub will focus on the incredible story of discovery and development of the idea of the floods by J Harlen Bretz and will discuss the effect of the floods on the landscape of the Willamette Valley and the area around us. Scott Burns, PhD, is a professor of geology and past chair of the Department of Geology at Portland State University where he has been for nearly 20 years. Scott specializes in environmental and engineering geology, geomorphology, soils, and Quaternary geology. In Oregon, he has projects involving landslides and land use, environmental cleanup of service stations, slope stability, earthquake hazard mapping, the Missoula Floods, paleosols, loess soil stratigraphy, radon generation from soils, and the distribution of heavy metals and trace elements in Oregon soils and alpine soil development. He has won many awards for outstanding teaching including the Distinguished Faculty Award from the Portland State Alumni Association in 2001 and the George Hoffmann Award from PSU in 2007. He has authored over 90 publications and has had over 25 research grants. He actively helps local TV and radio stations and newspapers bring important geological news to the public and, for the past 40 years, he has been studying wine and terroir—the relationship between wine, soils, geology, and climate. Join us for a day of community holiday cheer and shopping on December 3rd in Historic Downtown Hillsboro. Everything starts at 1:00 PM with a Holly Days Marketplace, where you can shop for gifts, produce, baked goods, foods and even get your Christmas Tree or a wreath or two. Gayle Ritt Performs on the stage from 2-3 and the Tualitin Valley Harmony Masters at 6:15. ~Tree lighting with Mayor Willey and special guests. Hillsboro Solar Advantage is a citywide solar incentive program presented by the City of Hillsboro, in collaboration with SolarWorld and LiveLight Energy. Participants who sign-up by October 31 can ensure eligibility for 2011 federal and state tax credits. The state tax credit will be lower in 2012. Two informative Hillsboro Solar Advantage workshops will be held in October. Please attend both! Watch how the world’s best solar panels come to life in Hillsboro, from raw silicon to finished product. Attend a presentation on financing options. Come and explore how solar and other smart, energy efficient options work in a friendly, fun roundtable event. Meet with table hosts and collect handouts about all your energy options. 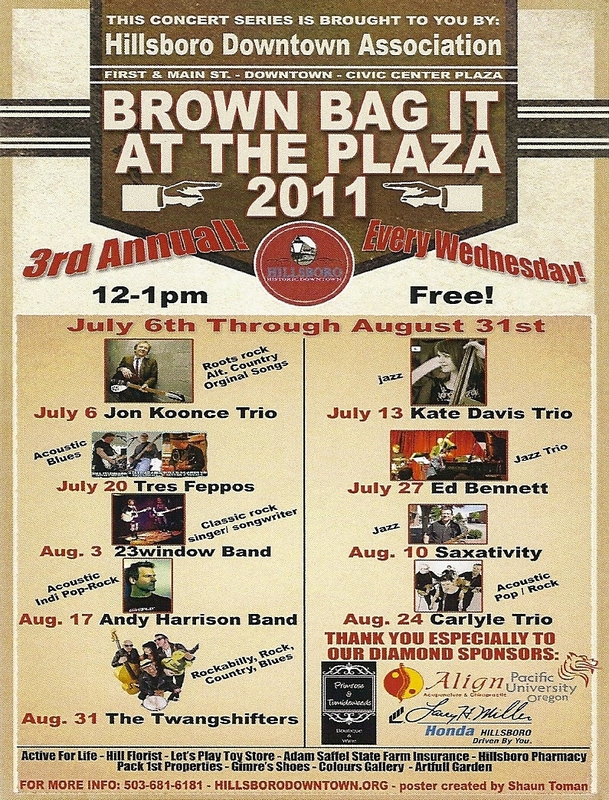 Enjoy a free concert every Wednesday, July 6th through August 31st, Noon to 1:00 pm, First & Main at the Tom Hughes Civic Center Plaza. Yo! Wanna help break a world record? Come to the Civic Center Plaza at 11:30 on Saturday, July 23rd to get your free yo-yo and be a part of the world record. This is in conjunction with Celebrate Hillsboro a free family festival offering live music, arts and crafts, health and wellness, sustainability, athletics, Saturday Farmers’ Market and community booths. After the Yo-Yo event shop Historic Downtown businesses where you can “Show Us Your Yo!” and receive a free prize. Look for the “Show Us Your Yo!” poster in the business window. If you are a downtown business and would like to partner with Hillsboro Downtown for this event contact Lorraine@hillsborodowntown.org , no later than Tuesday, June 21. Gain a marketing advantage over your competitors, reduce the amount of waste your business sends to the landfil,l and save money on your bottom line.